NUDESTIX Magnetic Eye Color in Spirit ($28): I think I’ve made it pretty clear that I love NUDESTIX, particularly the Magnetic Eye Colors. A little while ago, I was totally obsessing over a deep bronze shade called Immortal but now, I’m totally in love with a light, almost purple-esque, pearly bronze shade called Spirit. It’s such a unique colour that looks natural but still really interesting – perfect for summer. These pencils blend so easily with your fingers, last all day and leave a lovely wash of colour on the eyes. Everyone needs to try these! Benefit Speed Brow ($22): I wrote a full blog post on this a while ago but since then, I got quite lazy and kind of let my brows do their own thing. They got particularly unruly in May and Speed Brow was exactly what I needed. I have big, full eyebrows so I really don’t need to draw anything in. Speed Brow just helps all the hairs stay in place throughout the day and makes them look more polished – a well established eyebrow look if you will. Bobbi Brown Art Stick in Harlow Red ($30): I wrote about this lip pencil when I first got it (I really did rediscovered some old favs for this post) but it was totally a handbag staple for me in in May. This is just a good, cherry red that’s incredible comfortable to wear. Day or night, this is definitely my favourite red right now. It definitely doesn’t have the longest lasting time but it fades away very evenly – just don’t make too many coffee runs and you’re good to go! 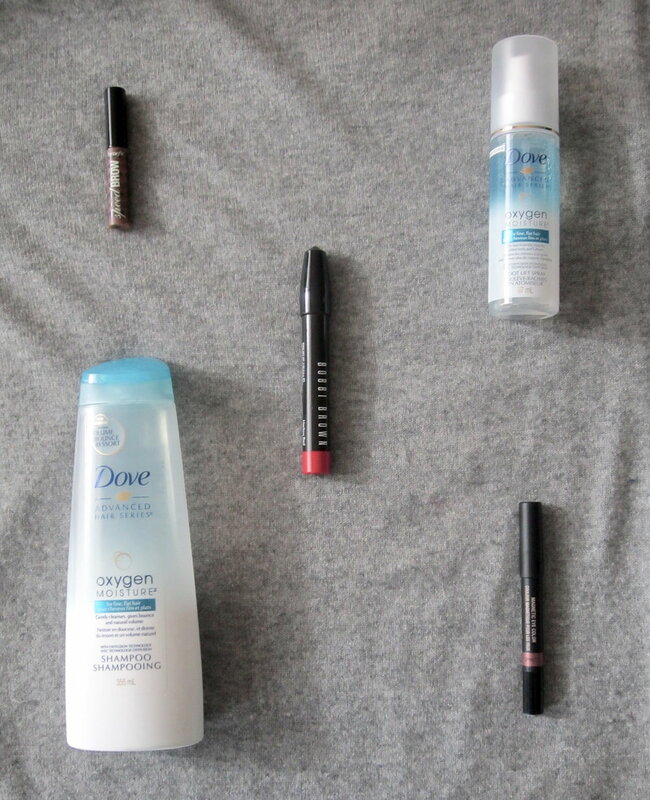 Dove Oxygen Moisture range: I mentioned the Root Life Spray in my April Favourties post but in May, I added the Oxygen Moisture shampoo to the party. I have to say, I am really enjoying this range. My fine, flat hair looks thicker and more voluminous than ever. I also find that my hair is a lot cleaner when I use the shampoo – I can actually go 3 days without washing my hair (just a little dry shampoo on the third day and I'm good to go). These two products are definitely my hair dream team at the moment.